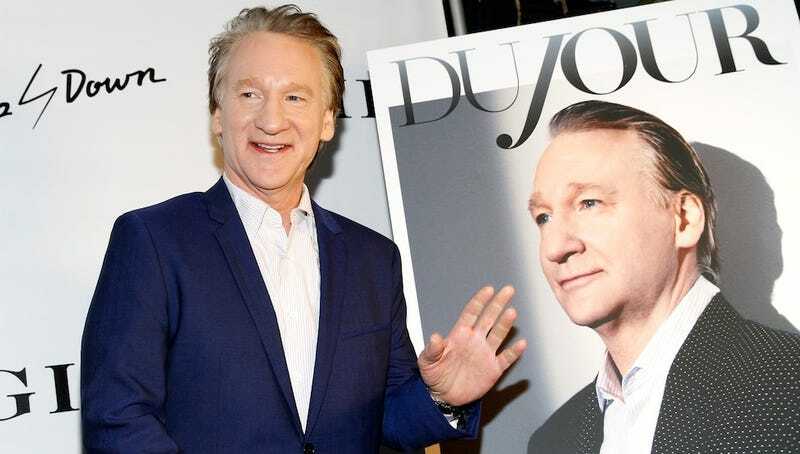 The subject of the most recent installment of US Weekly's "25 Things" is TV host and liberal who makes me not want to be a liberal anymore Bill Maher. It's just as insufferable as you'd expect, but it's in the wrong order. I fixed it. From least to most obnoxious, here is the Bill Maher on Bill Maher list, reordered. 3. I've never missed a taping of either Politically Incorrect or Real Time. 8. My favorite movie is Saving Private Ryan, which is also George W. Bush's! 23. I'm not good at math, but I can remember dates of any random event. 17. I have more than 5,000 songs in my iPod and I've listened to them all in alphabetical order. Twice. 9. I've kept a health log since 1975 with any medications I ever took. 24. Someone once called me a male chauvinist lamb and I was OK with it. 5. I'm a minority owner of the New York Mets. 13. I gave President Barack Obama's super PAC $1 million in 2012. 25. I've been nominated for 34 Emmys and only won once – was it something I said? Nah. That couldn't possibly be it.